Recycled shipping containers are becoming more and more popular as a viable sustainable building material, and this year’s West Coast Green show house highlights this growing trend. The showroom highlight of this year’s event is Lawrence Group’s SG Blocks Container House, fashion out of five shipping containers and a plethora of other eco-friendly building materials. As a prefab, the home is affordable, cute, and easy to assemble — demonstrated by the fact that the model at West Coast Green was erected in less than 5 hours. Where the house is not constructed of used shipping containers, it uses FSC-certified wood. To keep the home energy efficient, solar panels to produce energy and high-performance and Integrity glazing windows for effective insulation. The exhibit at West Coast Green also integrates rainwater recycling and landscaping that minimizes water use and maximizes passive solar design. And even with all the design innovation it employs, the home in still very affordable: running about $150 per square foot for the 1,700 square feet showroom model. It sure is interestng, I am hoping I am aware it sooner. Why do architects take a basic building block - the standard shipping container - and try to alter it with no regard for cost? Perhaps that's what architects do? They obviously have no intention of addressing the main 2 problems. No. 1 There are thousands of cheap, unwanted shipping containers. No. 2 There are thousands of homeless people. Anybody who has been camping in a caravan or tent knows that anything up to 6 people can be accomodated in a space of 8ft x 20ft. With eating, sleeping and washing/toilet facilities so that area for just one person should be ample if not luxurious. If you take a 20ft container and take off the doors and install an 8ft patio sliding door inside the frame and cut a single doorway down the other end, you end up with living space with ample natural light and you can stack them like lego blocks up to a height of 10 levels. They can easily be bolted together using what they use on container ships (twist-locks on the corners) and it is as firm as a rock, after all they stack them like this, full of 20 tons of goods and go to sea in all weathers so permanently bolted together and on "terra firma" would even be hurricane proof. Students, elderly, hospital patients, prisoners, the list is endless. And for those people who say "160sq.ft doesn't give much space for sitting around and entertaining friends" then put another row of 20ft containers (ones with no sides, just the frame) as a common open area between 2 rows of accomodation units, like a wide hotel hallway. The possibilities of using a waste product to house the homeless is too good an opportunity to miss. Forget architects, they are only good for designing high priced buildings, Students everywhere, sit down with a piece of paper and draw a 20ft x 8ft plan to scale and see what you can get into it. You may become the "architects" of the future. I bet part of the high dollars is the low production at this point AND a hefty artichoke (AIA) fee. Re: The Harbinger contaoner house? I want to have one? How do you obtain plans? or dimensions of the house? Can they import to Australia Does anyone have any idea? The Concept is very cool, I just wish the interior matched the exterior..
Before we continue this discussion about the priorities of architects and what "affordable" means, just keep these few above mentioned points in mind. One person’s definition of affordable may be compeltely different than another’s. Look at the comapny call “Design Within Reach”…perfect example. The Harbinger is not a house for Habitat for Humanity nor is it it a HUD house. Many times the term "affordable" is equated to "low-income" which is an incorrect assessment. My opinion of the Harbinger is that it is a house that could very easily be affordable to a low to moderate income family (without all the bells and whistles). The Show house is just that, a "fully-loaded model home" that demonstrates all the different varieties of green products they could cram into a house on a very tight schedule and budget. so $250k or a "fully-loaded" model home is pretty darn good if you ask anyone. The house is also fully adaptable to all green technology like solar, wind, geo-thermal power; not to mention that you can adapt even more green technology than they've shown here. My assumption is that it could very easily be placed in the nation-mean of $150k-$170k with some slight modificaitons to the materials used and smart editing. Just replace all the expensive windows with more standard (off the shelf) efficiency windows and you've already saved about $60k. The cabinets (although are beautiful FSC Certified wood cabinets, could be trimed down to a more modest manufacture and you could save too. The Entire house had bamboo, cork, and reclamed hickory flooring, very expensive as well. the upstairs could be carpet. The tile work in the baths and the fixtures used are very High-end as well from Rohl. There are more "affordable" alternative "Green" products out there that could be substituted. The show house had many donations/sponsors and were accounted for in the cost of the house. So these are all examples of why some may consider this out of reach of some buyers but could be trimed down to gain the same affect. It's been a problem i'm seen in the market that they only show you the most high-end products but there are some out there that get less press but achieve the same "Green" goals. Hopefully Inhabitat could start promoting them as well? To answer the quetion on rainwater re-use. The House had "Rainwater HOG's" installed at the show to help collect rainwater. Just Google it. One aspect I need to comment on is the cost of the high-end materials that went into this house. Nanawall is not cheap my friends. I was told those two segments of Nanawall cost $30,000+ and the Marvin windows were around $25k-$30k; so you’re talking about $50k-$60k just in windows. This showhouse was designed with all the bells and whistles, that’s typically what showhouses are for. The house can and will be built for less and have a simlar of not the same look. In comparison, Michelle Kaufmann’s house from last year cost roughly $350/s.f. to build. So this house is considerably cheaper to build from comparision to last year. One other aspect to this house with regards to saving money is that you save in labor time. When you build a house on a site, the contractor has site managment costs and bills the owner for his/her time building the house. Since SG Blocks can be pre-fabed, it takes considerably less time on site to finish (around 15% less time). This show house was assembled in just under 5 hours and took 4 weeks to build from the time they got the raw containers to the time is was finsihed at the show. I really would have liked information as to how they incorporate reuse of rainwater. 150$/sq. ft., by 1700 sq ft, is $255,000. it seems that this is catering to the upper-middle class, when things like this are needed en masse. This really needs to be in the 100k-150k range for most of the US to take advantage of this. I love the two tone color it has. Plus the two story is very nice and would fit well on suburban lots. This is great, where is it? I like the concept but I wish we could see the interior. I am all in favor of the prefab movement. Recycled shipping containers are becoming more and more popular as a viable sustainable building material, and this year's West Coast Green show house highlights this growing trend. The showroom highlight of this year's event is Lawrence Group's SG Blocks Container House, fashion out of five shipping containers and a plethora of other eco-friendly building materials. 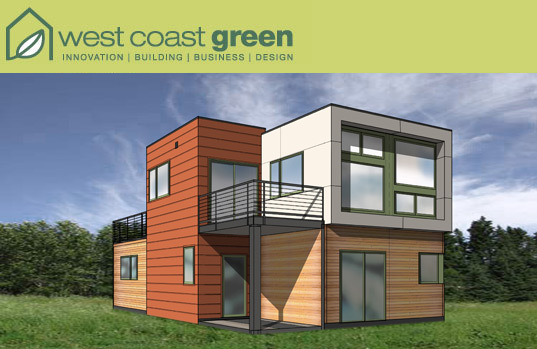 As a prefab, the home is affordable, cute, and easy to assemble -- demonstrated by the fact that the model at West Coast Green was erected in less than 5 hours.